You might not know this, but I am getting married this November. At WPPI, I had the opportunity to attend a talk about Content Marketing given by Jared Bauman, co-founder and president of ShootDotEdit. In it, he talked about how you can become a hero to your clients with the content you create because you are intersecting with them at a crazy, hectic, emotional time in their lives. They need your help. He talked about solving problems for your clients through your content. I immediately thought about the problems that I have been having with planning my own wedding. It’s exciting and overwhelming and dreadful. And, I wanted to put together five photography blog post ideas for wedding photographers. Topics that would help a stressed out and overwhelmed bride like myself! PLANNING A WEDDING IS TERRIBLE. I’ve already gotten sixty-five emails today about dresses I should buy, pins I should pin and vendors I should consider. Every Google search I do lurks in my Facebook feed of suggested posts and things I should like. It’s inescapable. My life is saturated with wedding. The hardest part is that all of the things I look at are exciting possibilities. If I could, I would do all of the things in all of the places and wear four dresses. I want to have a beach wedding in a barn. I want RUSTIC GLAMOUR. I want to have a different centerpiece on every table because I have so many cool ideas. I can’t. Or at least, I shouldn’t. I just have no idea how to edit. The fact is, there are so many topics that you as a wedding photographer can talk about that your bride will LOVE. Whether you discuss this in a blog post, a guide, or in a direct email- your expert knowledge of the way weddings work will be invaluable to her in this crazy time. Sometimes, they just don’t know the questions to ask. You do this every weekend. You know the questions. You have seen the horror stories. Chances are, your bride hasn’t even considered a third of what you know. So here is a list of blog post ideas for photographers. Call it my top 5 blog topics your brides want to know about. It looks great when they’re trying it on, but what are the things brides should think about before saying “Yes” to the dress? Why do photographers hate strapless dresses? What can’t you “Photoshop out?” Picking a dress is hard because you are getting pressure from the family and friends you brought, but you also have a salesperson and a manager who are driven to close a sale. What do you see at weddings that your future brides should consider? Brides and grooms may not know exactly how the timeline of the day should work with or without a first look. Tell them about the benefits of having that quiet time together before the ceremony and how it allows them more time for bride and groom portraits. Break down the pros and the cons to help them make a more informed decision. This can even be a series of blog posts. You already have amazing images from past weddings- use them to share ideas on themes! Barn weddings. Beach weddings. Vineyard weddings. Ballroom weddings. Library weddings. Tent weddings. Hotel weddings. You can showcase images from the past and help inspire your brides with your beautiful images. Posts like this can be repurposed and recirculated. They can act like articles you can link back to. Book a bride who is getting married at a local vineyard? Send her the link to that blog post! She will love looking through those images. You also will get to tag people and vendors from the wedding you feature. I’m sure you are no stranger to brides with unrealistic timeframes. Even with a trial run on her hair, she still thinks that she can get ready in ten minutes. Suddenly, everyone is running to stay on schedule and the time for pictures gets truncated. Offer timelines for the day. Talk about some of the variations you’ve seen. Has it worked well? Is it okay to do cocktail hour before the ceremony? When SHOULD they cut the cake? Since you’re the one who will be capturing the images, it’s important to have a dialogue if they’re going to get creative with the timeline. Brides just assume you’re psychic and don’t ever have to use the bathroom. Having something written down to help them understand what “normal” is can help everyone. Sure, you can’t teach someone how to be photogenic, but break down ways that brides can be aware of how to look their best. From posing to posture, offer some wedding day wisdom to help your bride prepare. 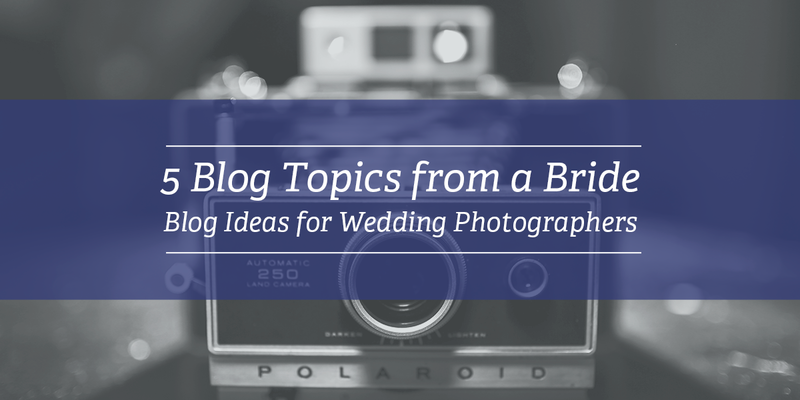 There you have it – 5 blog topics for photographers that brides want to hear about. The hardest part about crafting great content is having the images, but you already have plenty of those! All of us here at Fotoskribe would love to help you craft some valuable content for your present and future brides, especially me! Remember, wedding is my default setting this year. Questions? Want to know what a bride really thinks in the eight months before her wedding? Contact us and we would be happy to help!